Flatbread pizzas for the win! Here are 7 Must-Try Flatbread Pizza Toppings that we love to have on rotation. They’re quick, easy, and guaranteed to rock pizza night in record time! Skip delivery, nix the frozen boxed pizza, and whip up a delicious homemade pizza in no time with the help from some fluffy flatbread. You can use naan bread, pita bread, or your favorite bakery flatbread to make these easy peasy pizzas. I’ve even included some bonus ideas for topping your pizzas below our top 7. 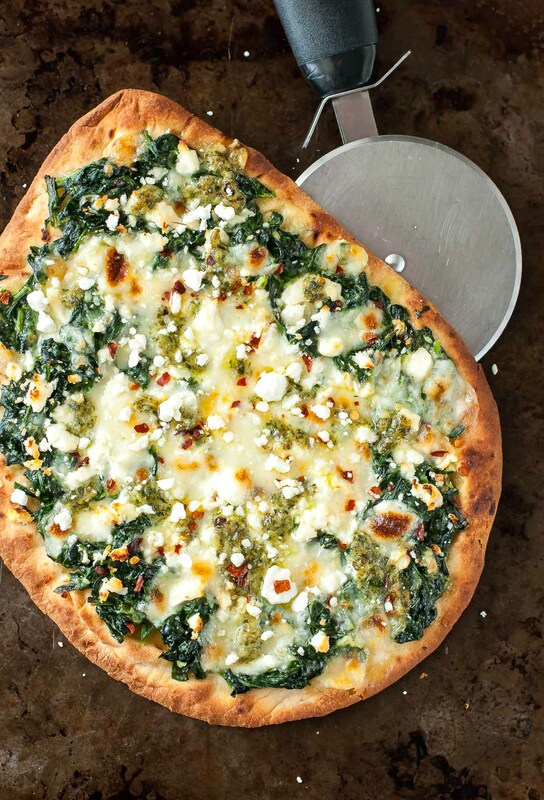 What happens when you top a garlicky flatbread with homemade creamed spinach, three kinds of cheeses, and pesto, glorious pesto? Lunch. A really, really, ridiculously yummy who-needs-a-pizzaria lunch. Or dinner. Or a tasty snack for two if you have an particularly peckish significant other hovering over your shoulder. You know what? You could make this for breakfast and nobody would judge you. It’s just too good not to. 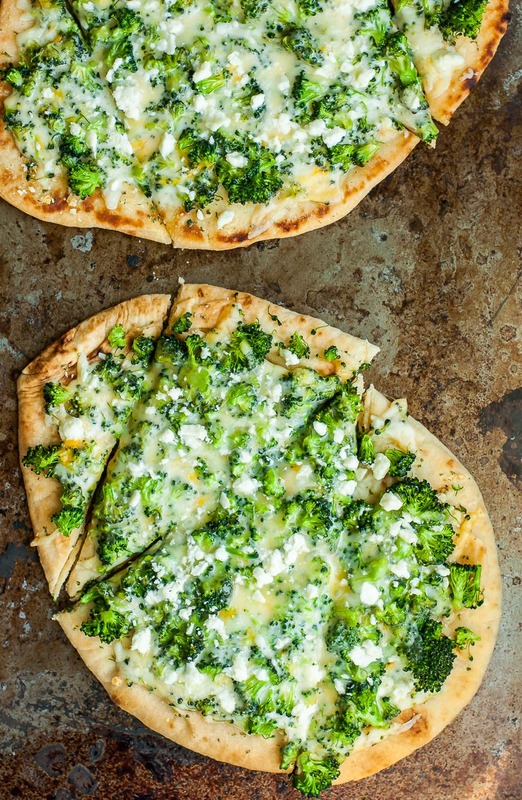 This cheesy broccoli flatbread is nothing short of amazing. We’re a huge fan of topping ours with a sprinkling of feta and fiery red pepper flakes for good measure. I’m all about the caramelized mushrooms lately! These flatbread pizzas combine creamy havarti cheese with crispy shallots and a sprinkling of fresh spinach. (We like to make it rain spinach over here) Please tell me I’m not the only one trying to eat my screen right now. 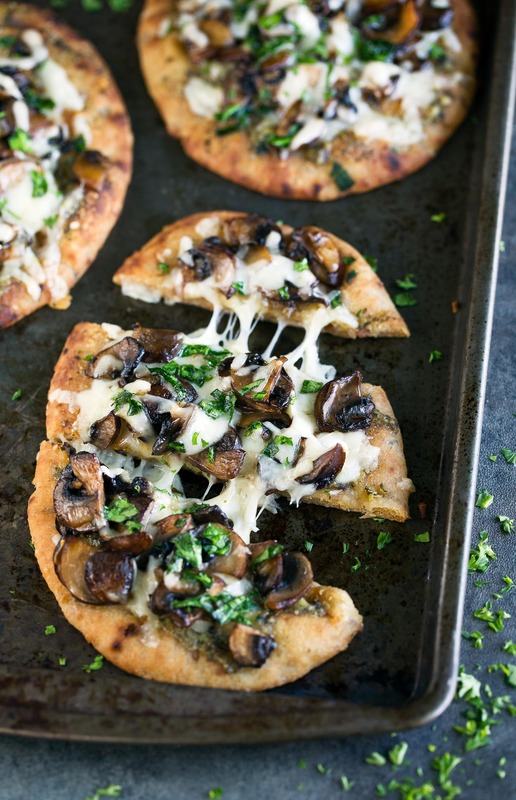 These caramelized mushroom flatbread pizzas are SO GOOD! I’m seriously loving this white-pizza-gone-green with it’s garlicky pesto base, melty medley of cheeses, and fresh vegetables. YES PLEASE! No kale handy? You can totally make this with spinach too. My Hawaiian Pizza loving husband pretty much adored me for this one! I basically never want to have HP without some sort of smoky-sweet barbecue sauce situation involved ever again. Holy deliciousness, batman! The pairing is just so super tasty together, you guys have got to try it! 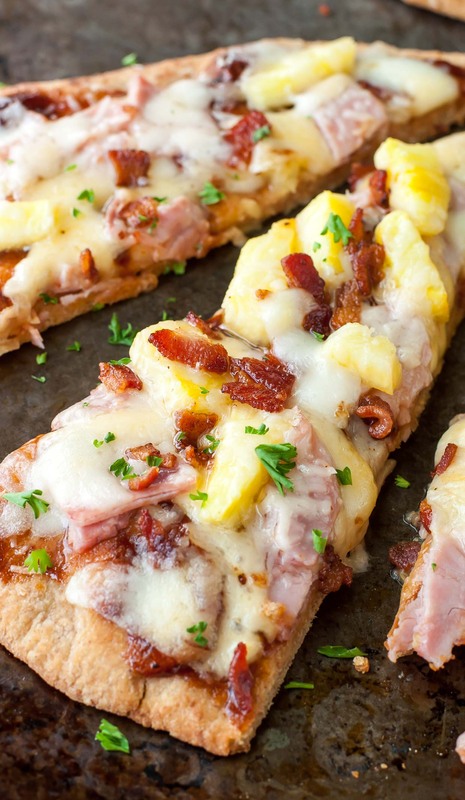 This pizza features ham, bacon, pineapple, barbecue sauce and a blanket of melted cheese. Mmmmm sweet potato on pizzas… Yes please. Factor in a hearty drizzle of deliciously smoky BBQ sauce and some cool and zesty ranch dressing and I’ll be sweet potato wasted for the rest of the year. 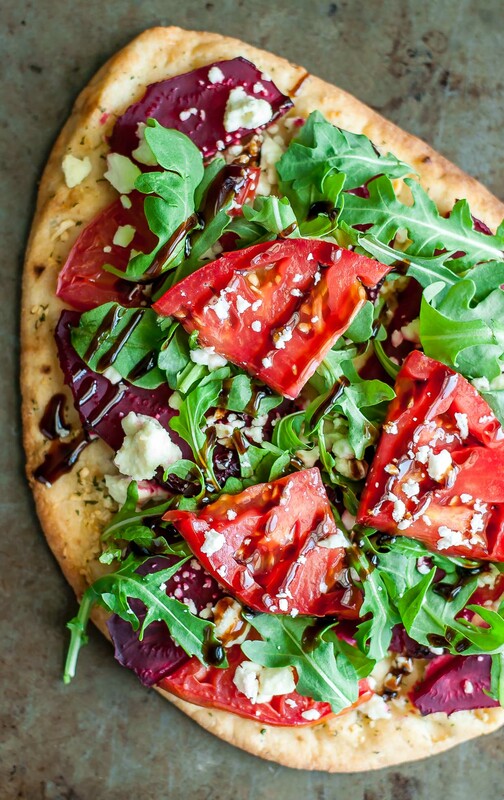 Bad rap aside, beets are fabulous for you and this beetza is legendary: the sweetness from the tomatoes and balsamic glaze, the creaminess from the salty goat cheese, and the peppery bite of baby arugula will make you forget your’re scarfing a pizza covered in beets. Factor in the fragrant herbed garlic and the underlying sweetness of those tender beets and well… yum! Seriously though, give beets a chance. Looking for more feisty flatbread pizza toppings? Tomato, Mozzarella, Balsamic, Basil <– Our new favorite! Have fun with it! The glory of these easy peasy pita and naan pizzas is that you can add any toppings your heart desires. 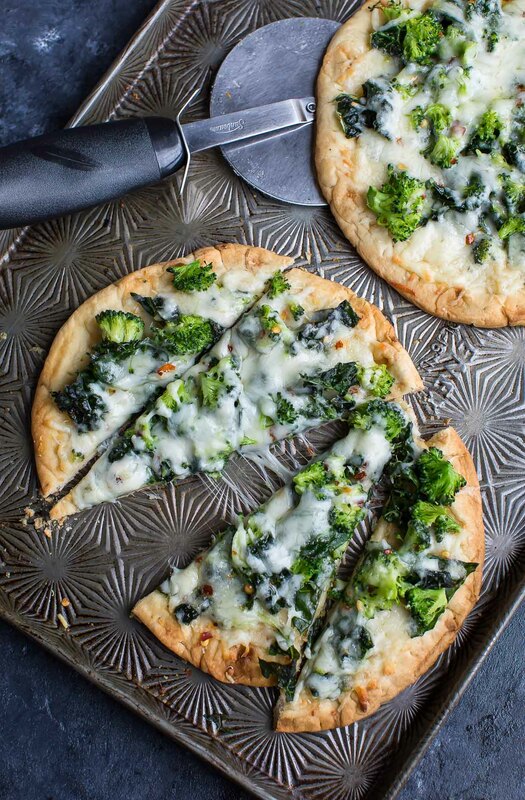 Empty out the crisper and host a make-your-own-pizza night with friends and family! If you get a chance to try any of these 7 Must-Try Flatbread Pizza Toppings, let me know! You can leave me a comment here (LOVE checking those daily!) or tag @PEASandCRAYONS on Instagram so I can happy dance over your creations. I can’t wait to see what you whip up! What’s your all-time favorite topping combo?